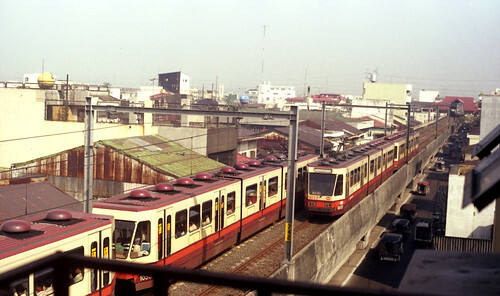 Manila Light Rail coupled articulated train sets 1056 + 1055 passing 1017 + 1018 at Tayuman, Santa Cruz, Manila, Philippines. Photo taken on November 8, 1994. This photo was taken from the Tayabas Hotel building on Avenida that is now not in use as a hotel.